Recently, I was asked by a friend to comment on medical issues related to Earthquakes. 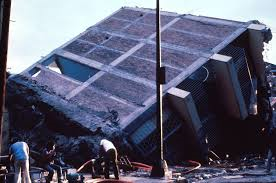 Seismic events are major concerns on the West coast of the United States, and the number of casualties could be significant, especially if access is lost to modern medical services in populated areas. Even in normal times, there are many areas away from cities where the ambulance isn’t just around the corner. Take a cross-country road trip and you’ll realize that there’s a lot of territory where medical help may not be readily at hand. 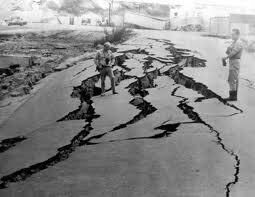 The effects of an earthquake may be spread over a large area. 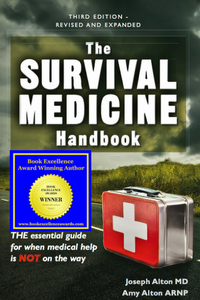 The sheer number of casualties spread out over a seismic zone might overwhelm medical personnel. Those that report for duty, that is; some will understandably prioritize family over civic duty. Certainly, the distance of some rural areas from the nearest health facility makes it unlikely that help will soon arrive. The types of wounds incurred in a major earthquake will include hemorrhages, sprains and fractures, burns, and crush injuries. We’ve talked about all the rest in past articles, so today, let’s concentrate on crush injuries. Crush injuries are problematic when they happen and when they’re treated. Bleeding vessels may be disguised if the skin isn’t broken. They may present, instead, as severe bruising or an accumulation of blood in body tissues known as a “hematoma”. In the chest and abdomen, hemorrhage is hard to control with modern facilities. Depending on the location, direct pressure may cause bleeding to abate. But pressure at the suspected site would be more effective if there were a skin breach that allowed visualization of the wound and packing with dressings. A complication of significant crush injuries is known as “compartment syndrome”. 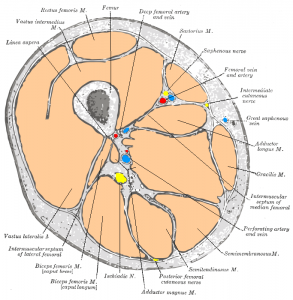 Groups of organs or limb muscles are supported in sections by tough connective tissue known as “fascia”. These form compartments. Ordinarily this provides strength, but in a crush injury, excessive pressure builds up due to volumes of free blood or the weight of the impacting body itself. As a result, muscles may swell or blood may accumulate in one or more of these compartments. Because of the fascia, there is nowhere to go. The increased pressure prevents good circulation, leading to a lack of oxygen in the area. The end result is sometimes irreparable damage to nerves and other tissues. Paralysis, organ failure, or even death may ensue. 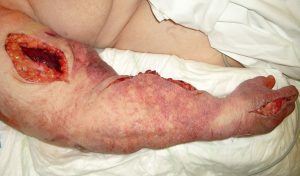 The first sign of compartment syndrome is, as you might imagine, severe pain. This is followed by “pins and needles” sensations. The limb becomes swollen and shiny, losing sensation and function the longer the weight is upon it. If the injury is confined to a small area, say only a part of the foot, the effects are usually confined. When larger areas are involved, however, the situation becomes much more complex. 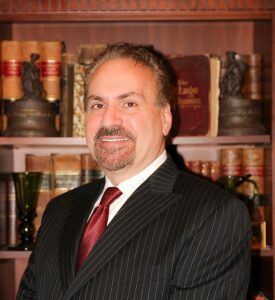 The dilemma is that the victim is in danger while under the extreme pressure of the offending object itself, but also when the pressure is released. Releasing a person who has been under a crushing weight for a significant period of time is called “reperfusion syndrome”. Dying muscles and organs release toxins that can not only cause local effects like paralysis of the affected area or dysfunction of the particular organ, but also overwhelms the kidneys’ ability to eliminate those toxins, leading to renal failure. These toxins include potassium, which can be released in large quantities throughout the body when pressure from the crush injury is released, causing life-threatening irregular heart rhythms. It’s a good idea to keep a crushed extremity below the level of the heart to aid blood flow. If the affected area has been under crushing pressure for a short period of time, say 10-15 minutes, try to lift the weight off them. Longer than that, let emergency medical personnel make the decision. They will often administer IV hydration, oxygen, and certain medications before removing the weight. Some recommend the placement of a tourniquet as well, to prevent toxins from flooding the rest of the body. 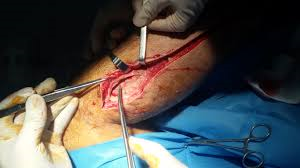 Once at the hospital, surgeons will often have to make an incision in the fascia to release the pressure in the compartment. It doesn’t get easier from here. Intensive care personnel will have to monitor the victim for kidney failure and a host of other issues. Other that stabilization, there’s not much more you can do with a crush victim in an earthquake without modern medical and surgical care. Besides the crush itself, fractures, sprains, and internal bleeding combine to truly challenge the lone medic off the grid. Fill those holes in your medical supplies with individual items or complete kits from Nurse Amy’s entire line at store.doomandbloom.net!